The 2019 national hurling league is at an end; Limerick have followed up their All-Ireland win with a league title, cementing their position as the team to beat this year. It was their first league win since 1997, and was gained only one year after they gained a long overdue promotion to division 1A. However, Limerick aren’t the only story of this year’s league. In this article, we’ll look into how each team performed, and what adjustments they might need to make before the All-Ireland begins next month. For those who weren’t following it, the tables below indicate how each team performed in the league this year. The top four teams in each group progressed to the quarter finals, while the bottom two in each group met in a relegation playoff. It’s worth noting that there will be no relegation from 1A to 1B next year: though there was a relegation match between Cork and Kilkenny, this was merely to decide how next year’s tables would be seeded. From 2020, 1A and 1B will be parallel to one another, rather than 1A being above 1B. The final table definitely appears to support this decision: the top three teams in 1B all won their quarter-final matches against their 1A opponents, while even the lowest ranked 1A teams won 2 out of 3 of their games, indicating that there just isn’t much separating the top 9 teams. Given how things have worked out over the last few years, it doesn’t make sense to give the best 1B teams easier routes to the quarter finals, while you have relegation games between the likes of Kilkenny and Cork, two teams that remain very strong. How well did each team really do? Though next year’s league should have greater parity under the new format, this year we still have to work around the fact that not all games are equal: For example, Limerick finishing with a group stage record of 3 wins, 1 draw and 1 loss in 1A is much more impressive than Galway finishing with the same record in 1B. To get a better idea of how each team really performed, we need to look beyond mere wins and losses. One such technique to account for this is the tournament rating: This gives each team a rating based on their win percentage and the rating of their opponents. Using the BAINISTEOIR v2 rating system’s Elo score for each team prior to each match, a tournament rating can be determined for each team; the rating is equivalent to what you’d expect a team’s rating to be, given their performance against the given competition. For example, if your average opponent had an Elo score of 1500, and you won 50% of your games, you would be expected to also have a score of 1500. If you won 100% of your games, you would be expected to have a rating of 2000, as a 2000 rated team should win ~95% of the time against 1500 rated teams. While this table has a lot of teams finishing in similar positions as they finished in the actual league structure, there are a few differences. It indicates that the semi-finalists were indeed the top 4 teams (Though it does think that Wexford had a better group stage than Galway). However, both Cork and Kilkenny were felt to have had better performances than Tipperary, who qualified above the other two on score difference. Again, it has Tipperary as marginally better in the group stages, but Tipperary’s loss to Dublin was considered a bigger upset than Kilkenny’s loss to Cork. Following their win over Kilkenny, Cork were also rated above Clare in the overall ratings. Laois were also easily the weakest quarter final team, finishing below Carlow in the overall ratings; though both beat Offaly and drew with one another, Carlow also managed an upset draw against Galway, boosting their rating significantly. The tournament ratings also acted as a small predictor of the winners of the relegation playoffs; despite being placed lower in the group, Cork and Carlow were rated slightly higher after the group stages than their opponents. By and large, however, it does look like the most deserving teams went the furthest in the competition, indicating a pretty fair league. Fairness is hard to quantify just by looking at the numbers, but there is a rough test for it: Pythagorean expectation. This is a rough estimate of how many games you’d expect a team to win or lose based on how much they scored and conceded across the entire tournament. If a team scores and concedes about the same, then you’d expect them to be close to a 50% win percentage, whereas a team that scores lots and concedes very little should win most of their games. The table below displays what winning percentage each team would be expected to have, based on their scoring, and compares it to what they actually had. For the most part, teams got roughly the results they deserved. The vast majority of teams were within one draw of what you’d expect. Only two teams had at least one win more or less than expected: Dublin were the ‘luckiest’, managing to win 5 out of their 7 games, one more than expected. This lowered expectation is the result of some very close wins over Tipperary, Waterford and Laois, while losing by a reasonably large margin to Galway. Tipperary were the most ‘unlucky’ team, as they only managed 2 wins from 6 games, despite a positive scoring margin that should have seen them with 3 wins and a draw. However, while they did have some unlucky defeats in close games against Dublin, Kilkenny and Wexford, their scoring figures were also inflated by their blowout wins over Clare and Cork. They were certainly unlucky, and arguably should have gone further in the league this year, but maybe not by quite as much as the numbers indicate. Overall, this year’s league was a case of what you see is what you get, possibly more so than average; no one team was particularly unlucky not to get further, and no team fluked their way to a better result than they should have had. Waterford come out far ahead of the rest of the pack; They scored almost 2 goals per game more than the average team. A bit behind Waterford, but very close together, Galway and Limerick form their own pack for 2nd and 3rd place. After this, we see the rest of the top tier pack; all these teams are close to the average offensively, but drift apart in defensive rating, with Tipperary and Dublin performing the best, and Cork and Clare performing the worst. Lastly, there is a separate grouping of the final three teams. Carlow performed well defensively, but all three of Carlow, Offaly and Laois are clearly a step behind the rest. This creates a rather different looking chart: The top 9 teams are packed tighter, with less extreme values both offensively and defensively. Galway, Waterford and Dublin now all have ratings that stand out a lot less, while Limerick takes a small hit due to their game against Laois: With Galway and Waterford’s decline, Limerick are now a clear front-runner, and Tipperary also emerge as a highly competitive team, with their offensive and defensive ratings roughly the inverse of Waterford’s. Waterford still have the best offensive rating, but they are actually below average defensively. Dublin joins Cork and Clare in a sub grouping of teams that are solid offensively, but need some more work on the defensive end. Galway also drops back somewhat, but remain in the cluster of front-runners. Another way to look at offensive and defensive ratings is to look at the BAINISTEOIR v2 rating system. The main rating of this system is how much it would expect each team to score and concede against an average rated (Elo rating of 1500) team. Because this accounts for the difference in abilities between the upper and lower 1B teams, it should provide a cleaner picture of how each team performed than simply ignoring Laois, Offaly and Carlow entirely: After all, Carlow held Galway to a draw, while Laois kept their game against Dublin very close, so it doesn’t feel fair to dismiss the capabilities of these teams entirely. The following chart shows each team’s offensive and defensive ratings before and after the league, and also indicates how much their expected scoring margin against the average team has changed in this time. In terms of overall trends, most teams saw an increase in their defensive score and a decrease in their offensive score. Whether this is due to innovations in how to handle modern offensive tactics, or simply due to worse weather in the league versus the championship, is up for debate. Both pre and post league, Limerick and Galway are ranked first and second, respectively. While Limerick took a small hit offensively, their improved defense more than compensated for this. Galway, however, have slipped a little bit, as they certainly under-performed in certain games this league, despite only narrowly losing out on place in the final. Waterford had the biggest improvement, both scoring and defending better after their injury-plagued 2018 season. They jumped from having the 8th best overall rating to the 3rd best. In contrast, the 3rd best team before the league, Clare, jumped the same amount in the opposite direction, finishing 8th. Clare were the only division 1 team to not see an improvement in defensive score, and they had the greatest disimprovement in offensive score of any 1A team. Other than these, teams that made significant improvements include Limerick and Dublin, while Kilkenny, Cork, Carlow and Galway all dropped off quite a bit. Carlow’s rating hit is understandable, however, as they make their transition from easier games in division 2A and the Joe McDonagh championship, into playing in divisions 1B and the Leinster championship. Finally, despite finishing last defensively and offensively, Offaly did not suffer much of a decline in rating; they had already been rated last in these categories by the BAINISTEOIR v2 rating system, and were favourites to be relegated from the beginning of the year. Now that we have a high level view of which teams are scoring and conceding the most, we need to break down what it is that they’re doing right or wrong in this regard. 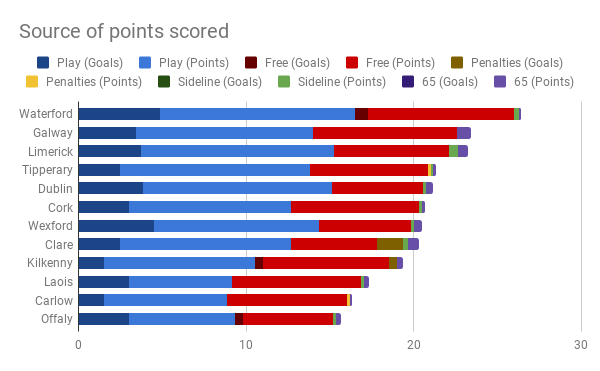 The following charts break down the source of each point scored and conceded per game, over the course of the league, according to whether they were from play, frees, sixty-fives, sideline cuts, or penalties. They are ordered by most points scored per game and fewest points conceded per game, respectively. These charts provide us with a lot of information, and can help us diagnose where some of the strengths and weaknesses lie for different teams. For example, Clare, who had the biggest drop-off in BAINISTEOIR rating over the league, have one of the clearest areas that need improvement of any team: They need to get the referee on their side. Clare have conceded more from frees and scored less from frees than any other division one team. On average, Clare conceded 10.5 points per game from frees, while scoring only half that themselves. If Clare were merely average, breaking even on frees, it would result in a nearly two goal swing in scoring margin per game. There have been some glaring examples of this costing Clare matches; against Cork, Clare lost by only 3 points, but conceded 15 points from frees, while scoring only 3 points from frees themselves. Clare scraped a one point win against Kilkenny, but could have won much more easily if they did better on either end from frees; they scored only 5 points from frees, while conceding 1-11. Speaking of Kilkenny, the charts above indicate that they’ve been having the opposite problem. No team has conceded less from frees per game than Kilkenny, giving up only 5.8 points per match. They also scored more than any other 1A team from frees. Despite all this, Kilkenny finished the league with 2 wins out of 6 games, with the worst offensive rating of any 1A team, and a below average defensive rating. Bizarrely for a county with such a strong tradition, Kilkenny have fared worst when games have gone into an open, free-flowing rhythm, and are at their best in slogs. In this year’s league, Kilkenny have conceded far too much from play, and don’t appear to be able to generate enough of their own scores to compensate unless they attempt to draw frees. They also appear to struggle with goals: they score amongst the fewest goals overall, and the joint fewest from play, scoring only one goal from play every second game; only Carlow have struggled with goals from play as much, and they went through their first four games without scoring a single goal. Carlow, additionally, struggled with conceding goals, as did Offaly, each conceding about 2 goals from play per game, on average. As well as negatives, these charts can also give hints as to why the teams that got further in the championship got these results: Limerick and Waterford dominated the scoring from play in their matches, while also preventing opponents scoring from play. These teams are simply not ones you want to challenge in an open, flowing game, and they both reached the final as a result. 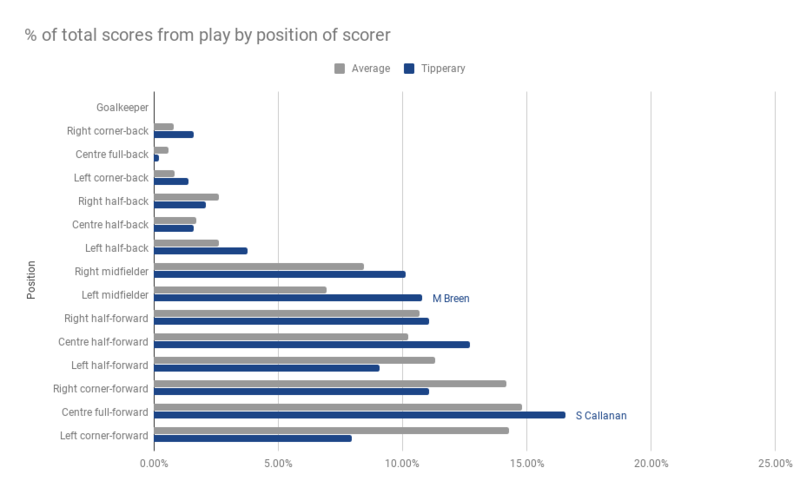 Galway and Tipperary did very well in defending points from play, though were held back due to other issues (Tipperary, for example, conceded an unusually large amount from sixty-fives and penalties, indicating that their close-range defense still needs refining). Another interesting example of a team doing something exceptionally well is Dublin conceding from set pieces other than frees; they have had issues with conceding frees, conceding more from these than anyone other than Clare or Laois. However, they have given up nothing from sixty-fives, penalties or sideline cuts. Though these are more marginal areas than frees or shots from play, they can still add up, and it’s also symptomatic of Dublin’s good close-range defense; Dublin conceded the joint fewest goals per game of any division one team, along with Waterford. While this article has, so far, been focused on overall team performance, individual greatness needs to be taken into account. Is it possible that some teams that have been performing well are susceptible to losing if they have one player taken out of a game? Similarly, are there underperforming teams that could be back on track if they can find somebody to fill a certain role? Analysis into this is limited, as beyond scoring, there really aren’t any useful stats that are readily available for all league matches. However, we can look into which positions are strongest and weakest for different teams offensively. The charts below display the sums of the average scores from play per match from each player, divided according to the typical positions at which they played in this year’s league, as a percentage of the average total team’s scores from play per match. Where positions have particularly large values (either >15% of the total, or >2.5% higher than average), the player or players at that position who contributed the most to the value are listed. Some trends definitely emerge for different teams, and it’s clear where teams are highly dependent on certain players, or need more contributions from certain areas. As we saw earlier, Carlow have been able to keep pace with the rest of division one defensively, but have struggled on the offensive end. Their chart highlights where they’ve been lacking in firepower: 24% of their scores from play come from a single position, left corner-forward, typically occupied by Chris Nolan. This is the highest dependence on scoring from play from a single position of any team. 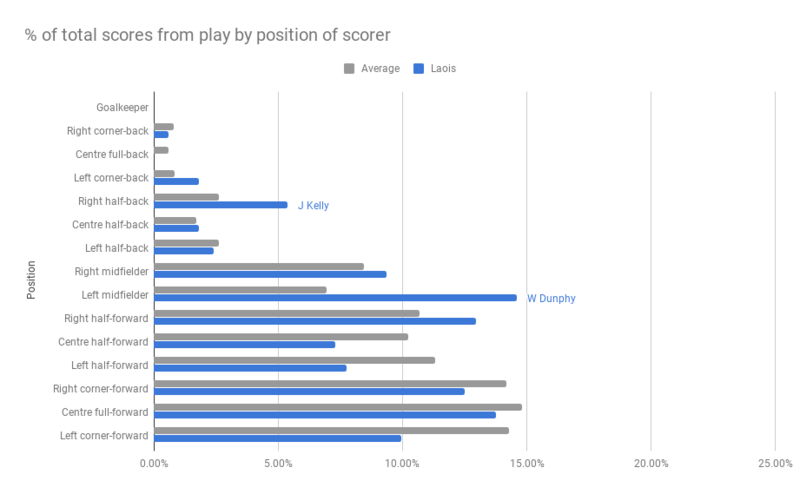 Though they also get solid numbers from their half-forwards, such as Martin Kavanagh and Séamus Murphy, the scoring load has not been spread to the midfield, which takes on much less of the scoring than on the average team. Clare’s under-performance in the league, by the other metrics in this article, make a lot of sense when you look at their chart. As a percentage of the team’s average score from play per game, almost no players were required for as high a contribution as John Conlon. Conlon started for Clare in their first four games, but was injured thereafter. 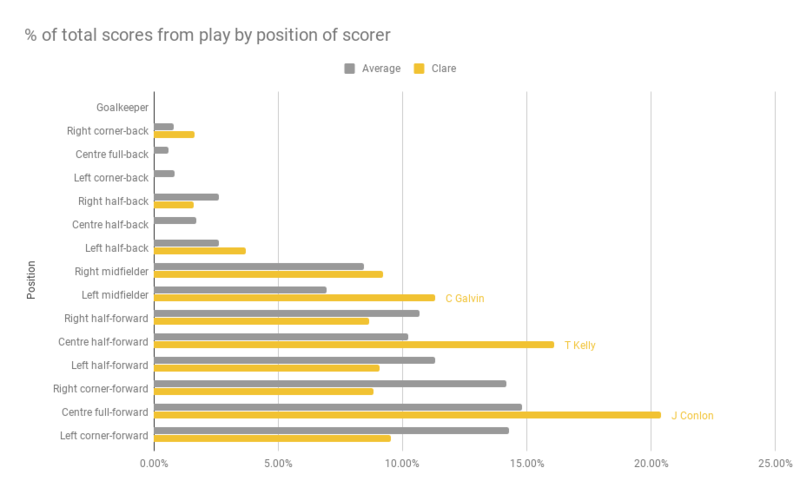 A noticeable gap in Clare’s scoring is how much of their scoring come from the corner forward positions; Shane O’Donnell’s absence in this year’s league was definitely noticeable, and the return of both him and Conlon should be hotly anticipated in Clare. An obvious question for Galway coming into Leinster is who will take over from Canning as their primary free-taker, now that he’s injured. Galway were more dependent on scores from frees than most, and it’s possible that they’ll need to find more opportunities from play to get back to the All-Ireland final. Galway currently find considerably more scores than average from midfield, typically through Cathal Mannion or Johnny Coen, with Niall Burke also doing a lot. Like many of the top level teams, they don’t have an obvious spot where they’re weak, but maybe just need small improvements across the board. Speaking of, a definite trend seems to have emerged from the teams that performed well in this year’s league: a strong rotation. Though this isn’t surprising, it really can be clearly seen amongst the semi-finalists: the positions where Limerick have scored the most haven’t been dominated by any one player (with the exception of Aaron Gillane, who’s stayed at one position scored more than almost anyone from play in this league), but instead had a rotation of strong players who are well suited to the team’s style of play, such as Peter Casey, Séamus Flanagan and Graeme Mulcahy at the full forward spots, or Tom Morrissey, Shane Dowling and Conor Boylan at the half-forward line. Of the players just listed, only Casey played in all eight of Limerick’s league games, and none of them started in every game. This kind of depth should continue to make Limerick very tough to beat going forward. Similar, though less dramatic examples, exist in other teams that performed well this year. Waterford and Dublin had multiple high-performing players to choose from in the full-forward line. Wexford, who finished 2nd in 1A, seemed determined not to pin any one player to their position; one of their strongest positions in terms of scoring from play was their centre half forward,occupied by 8 different players who scored from play. These teams have all built up systems and styles of play that attempt to put their star players in positions that amplify their abilities, but also have complementary positions that can take on some of the load if those star players are struggling. This helps highlight the value of a dedicated free taker: there is a moderate to strong correlation (r=0.533) between the total amount a team scores per game from frees, and the percentage of this value that their primary free taker scores from frees per appearance. Going back to Galway’s questions going forward; this definitely makes Canning’s potential absence in the All-Ireland a serious concern. It also raises some interesting questions for other teams. Teams like Wexford or Dublin, who’ve made massive improvements in the last couple of years but still haven’t convinced people that they’re true contenders, don’t score as much from frees as others and lack dedicated free takers. Perhaps this could be a key to making another jump in quality? Limerick have dominated over the last year, but this could also be an area to eke out another small percentage of improvement in performance, if they find a specialist to take over on frees. On the other hand, some teams may be too dependent on a single player, or that player may not be the issue. Peter Duggan has done fine for Clare, but they’re simply not winning enough frees for him to capitalise on this. What else could they be doing to win more frees? The most extreme example of dependence on a single player offensively is Offaly. Offaly’s best scorer from frees, Joe Bergin, is also their best scorer from play. Given their successive relegations from Leinster and division one, they clearly need more scoring options, because one man scoring 37% of the team’s total is not sustainable, especially when he only appeared in 4 out of 6 of their matches. Though not as drastic, Cork may want to take some pressure off Patrick Horgan; his average score from frees per game is higher than Cork’s total average, meaning they really seem to run out of free taking options when he’s not around. Horgan is also their joint highest scorer from play, both per game and overall. At the end of the day, it can be difficult to draw too many conclusions from the league: Players aren’t at their fittest, managers experiment with rotations, and overall, 6 to 8 games with limited data at the end of each one isn’t a lot to go on. However, from all of the above, here’s a very quick rundown, for each division one team, of what they could learn from this year’s league going into the All-Ireland. Carlow’s odds of surviving Leinster are slim. They have shown strong resilience, defending well and putting up good performances against stronger teams. However, they simply need more a lot more scoring power from play, especially when it comes to scoring goals. It’s come up again and again in this article; Clare need to concede fewer frees, and score more of their own. Whether they just need the regular return of some of their bigger scoring threats to draw fouls, or whether they need to bribe some referees, it’s clear that this is the area that needs the most immediate addressing for Clare to have another deep championship run this year. Cork have been good in a lot of areas offensively, but they need to be great. They have a nice, varied selection of players who can shoot well, getting their scores from a variety of sources, but they lack a star player putting up monstrous numbers. Their main issue, however, is that their defence has been lacking, conceding far too many points from play. Dublin did very well in this year’s league, but something worth noting is their scoring margins; in this year’s league, they won a number of games by a goal or less and reached a semi-final. In last year’s All-Ireland, they lost a number of games by a goal or less and didn't progress beyond Leinster. These fine margins leave too much room for luck to play a part. Offensively, Dublin mainly need to find more scores from frees, and potentially find a dedicated free taker to do so. Defensively, Dublin’s numbers look good overall, but if you remove their games against Carlow, Laois and Offaly, the numbers get a lot shakier; they need to do more to prepare for opposing star players, not just rely on a one-size-fits-all defensive system. Galway’s fortunes have potentially taken a big hit with Joe Canning’s injury in their final league game, but they could still go far. They are still able to fall back on one of the best defences in hurling today, and they still have a handful of great shooters. However, they need the entire team to pull together and find a bit extra offensively to try to compensate for the lack of Joe Canning. Kilkenny are the reverse of Clare, in some ways: they’ve been great at scoring from frees, and likely will continue to improve as Ballyhale players like TJ Reid return to the fold, but they’ve been severely lacking when it comes to scoring and conceding from play. It’s very strange to think that Kilkenny would struggle in an open, free-flowing, traditional 15 on 15 game of hurling, but if the returning players can’t deliver those improvements, that’s what we could be looking at. Laois definitely looked like a better organised team this year, easily defeating their local rivals Offaly to reach their first league quarter final in several years. They still have a lot of work to do, however. Like Carlow, they could do with more players who can score from play, but they really have their work cut out for them on the defensive end. If they can tighten up here, then there’s no reason they can’t reach the Joe McDonagh final and the All-Ireland knock-out stages. Limerick have continued their excellent form from the All-Ireland championship, and their depth should be frightening to other teams; they’ve rarely had a game this league where at least one star player came off the bench or didn’t appear at all. However, they’re not invulnerable, as they lost and drew a game. Given that teams are usually a bit amped up to face the reigning champions, they should probably be drawing more scoreable frees than they have been. Also, while they have a great defense overall, they’ve only been average at stopping goals. Despite these things, though, Limerick remain the team to beat, and were deserving league champions. They’ll be disappointed if they finish as low as third place in Munster again this year. Offaly really have a lot of issues to address, and are at the wrong side of the bell curve in almost all the stats looked at. No team scored less, no team conceded as much from play, and only Laois conceded as much overall. GIven their record against Laois and Carlow, it’s not a given that Offaly will regain promotion to Leinster through this year’s Joe McDonagh, as it currently appears that these teams are no longer beneath Offaly but at the same level at the very least. Everyone has their own theory on what Offaly need, and with how much they lack, maybe any of these theories could provide some improvement if committed to. It’s possible that Offaly need a totally clean start; over 50% of their scores have come from only two players, Joe Bergin and Shane Dooley, both of whom are over 30. Their fourth highest scoring player is their goalkeeper, scoring exclusively from long range frees. Offaly need to rebuild the team, and they really have nothing left to lose to prevent them taking risks on young players. This, combined with a coherent defensive system that relies on effort rather than star players could be the thing to get Offaly hurling back on track and back to playing at the top level. Tipperary had a lacklustre league, losing their quarter final to Dublin, while also only winning two out of their five group games, only going through on score difference. However, most of the statistics indicate that this Tipperary team has a lot more ability than many have realised. When they’ve lost, it’s usually been by very little, and when they’ve won they hammered their opponents by ridiculous margins. Additionally, a lot of their points conceded have been from unusual sources, like sixty-fives or sideline cuts, and it seems unlikely that this will persist. With a bit of consistency, and a bit more luck than they had in the league, Tipperary could be a dark horse in the upcoming championship. It’s hard to find a single area where they’ve really struggled, they may simply need to find their form, fine tune things across the board, and identify the areas where they can really dominate. Though they under-performed in the league final, Waterford are another team that could be a real contender going into the All-Ireland. Their scoring numbers are inflated somewhat by their easier games against the lower half of 1B, but they were definitely one of the best offensive teams from the league this year. Their defence could also be extremely stingy in some games, especially in preventing goals, but if Waterford can figure out how to do that every time, then they’ll go far this year. Wexford are difficult to figure out from the statistics above, as they don’t really play like anybody else. They’re much looser with who takes what position, and even though they struggle to win by big margins, this is often part of their strategy, as they give up early dominance to make use of their excellent fitness to beat teams down the stretch. Despite their non-traditional setup, though, many of their numbers put them as close to average for a division one team. After improving so much over the last few years, Wexford will be keen to make a final push that could see them firmly in the championship conversation, and there are a few areas this could come from; they certainly don’t score as much as they’d like from frees, and while their often positionless play is exciting and unpredictable, they might be better off with a few specialists to really dominate their area, rather than relying on lots of players who are Jacks of all trades. So, that’s that for the 2019 league. Lot’s of things to take away from it and, as always, there’ll certainly be a few teams who’ll surprise us in the championship, for which league form meant absolutely nothing.